At this point, you’ve probably heard about this global-sensation card game. It’s sold worldwide in most major retail stores including Barnes & Noble, Target, and Walmart. On Amazon alone, the base game and its expansions sell an estimated 90,000-120,000 units per month, for over $1,500,000 in sales. Cards Against Humanity makes millions monthly on Amazon alone. What really gets me excited about Cards Against Humanity, though, is that it’s a true Amazon success story. And it’s one that we, as Amazon sellers, can learn a lot from. 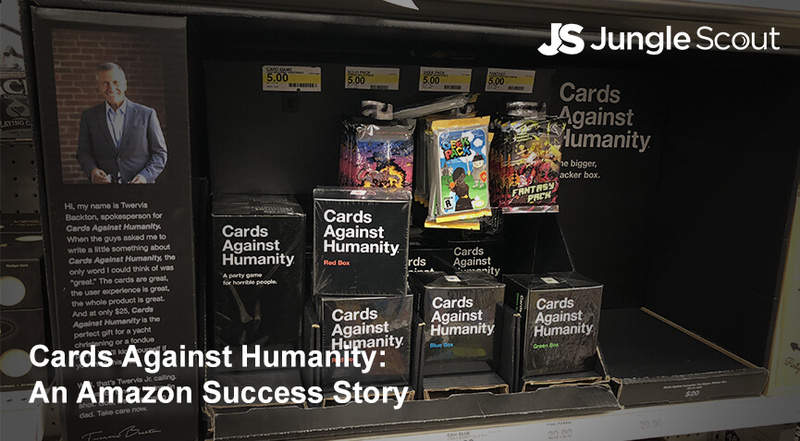 As I’ve followed and study Cards Against Humanity over the years, I realize that it’s an Amazon success story that we can learn a great deal from. Cards’ founder was just an ordinary college kid with a cool idea. He wasn’t working at a board game company. Nor did he have the requisite funds to manufacture a product. No, Max Tempkin was just an ordinary college kid who needed a way to entertain a large group of friends at a New Years Eve party. Max and friends created a simple prototype of the game (known then as “Cardenfreude”) and got everyone at the party involved. The game was a huge hit. At the end of the party, Max and his friends returned to their respective colleges and brought along copies with them. From there, college friends wanted to know how they could get their hands on it. Immediately, Max and his pals knew they had something big on their hands. And that’s all it takes. An idea, a way to test that idea, and the willingness to do work until you’ve created your own Amazon success story. This is the heart of what product research and ideation is all about. Of course, Max didn’t have the funds to make Cards Against Humanity into a professional product. Not yet at least. Don’t have the funds to create a product? Turn to Kickstarter. Max and the gang didn’t have the $4,000 in capital needed to launch a professional version of Cards Against Humanity. So they turned to Kickstarter. If you haven’t heard of Kickstarter yet, Kickstarter is an online platform that allows product developers to pitch product ideas to potential customers. If the customers like the idea, they’ll spend money to help the product developer bring the project to life. Once the project comes to life, those customers–now called backers–are sent rewards, typically an early version of the product. Originally, Kickstarter was used as a way for regular folks–like Max and his buddies–to get the funds for a product. Nowadays, even big companies–and sometimes Hollywood filmmakers–will use Kickstarter and other crowdfunding platforms to test a product before spending the necessary funds. Whether you’re launching a new product, or even just re-upping an inventory purchase for something that is already an Amazon success story, I highly suggest using Kickstarter. Not only does it help you reduce a lot of the risks that go into making your product, but it’s a great way to pre-market, too. Before Max and the gang even started their Kickstarter campaign, they were marketing the product. It was their goal to get it in front of as many people as possible before launch. Remember, this wasn’t a group that had a lot of money for ads. They had to go about it totally grassroots. They gave away free copies. To this day, you can still get CAH free on their homepage. When sourcing your own product and future Amazon success story, consider ways that you can build interest by offering up something free to generate leads (more on that below). Max created a print-and-play version of his game, which worked perfect for the card game. But if you’re selling a Kitchen/Dining product, you might give away a free digital cookbook. A buddy of mine creates fishing lures by hand and gives them away in exchange for email addresses–the best part, is that the customer usually pays for the shipping, too! They built a mailing list. Below the download button for the game, Max included an opt-in box where people could submit their emails for updates on a professional copy. A year later, when Max launched the game on Kickstarter, he leveraged the 1,632 emails that the site had gathered to earn pledges for the game. We’re emailing you to let you know that after months of work, Cards Against Humanity is available for pre-order for $15 through our partner Kickstarter. You were the first to show support for our game on our website, and we hope you’re still interested. Pre-order your copy of Cards Against Humanity at http://kck.st/fV9Fpp. We’ve spent the last few months dramatically fine-tuning the deck and adding dozens of hilarious and inappropriate new cards. If you pledge on Kickstarter, you’ll get the core set of new-and-improved cards as well as 20 exclusive Black Cards and 20 exclusive White Cards written just for our Kickstarter backers. We’ve put a lot of work into making a premium deck – the cards are 2″x3.5″, professionally printed and digitally cut. If you want 500 horrible cards delivered to your doorstep, claim your copy for $15 today at http://kck.st/fV9Fpp. 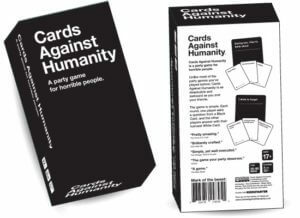 We’re excited to finally offer Cards Against Humanity how it was always meant to be played – as a high-quality, professionally-produced, boxed product. Thanks, and we appreciate your support! That simple email is what helped Cards Against Humanity earn the $15,570 needed to bring the project to life. This amount was actually 378% of the original goal, which was only $4,000. Whatever it is that you plan on doing, regardless if it’s Amazon or digital products like software-as-a-service, or even consulting, you’ve got to build a mailing list. There is absolutely no better-return on investment for capturing a lead, and once you have their email, you don’t have to pay to market to that customer ever again. They sent copies to influencers and reviewers. In addition to Max’s email list and free downloads, the CAH group made sure they got a copy of the game into some of the most influential and important game reviewers around. 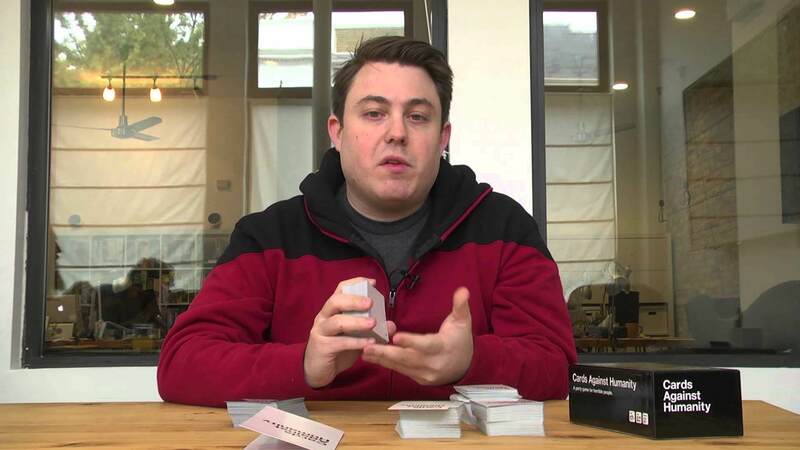 Social proof was crucial to making CAH a success on Kickstarter. Not only did this help with the campaign’s actual sales copy, but it the individual reviewers’ audiences and social media following helped get Cards Against Humanity in front of people who otherwise may have never heard of it. With Amazon products, you can do the same. Of course, you’ll want product reviews and seller feedback on the site itself, but putting a free copy into the hands of someone with a 20,000 follower Instagram account or a 17,000 subscriber YouTube channel can do wonders for you and your brand and help make it into an Amazon success story. Plus, you can use their comments and quotes as social proof on your brands’ site. Sourcing overseas isn’t just just cheaper; it’s easier. Once the game funded on Kickstarter, Max had to get the game made. He originally tried printing the game with a Chicago printer he’d used in the past for political campaigns, but learned that due to the game’s design demands–it had 550 original cards!–it was impossible to create unless they printed tens of thousands of copies. Max only wanted to print 2,000. He tried with other printers in the US, but everyone quoted $20 per unit. So Max turned to overseas manufacturers and discovered a company called AdMagic*. That’s who Cards Against Humanity has used since. By sourcing a Chinese manufacturer, Max was able to get smaller minimum order quantities, high quality production values, and a business that was willing to work with his designs. That’s the beauty of Alibaba and GlobalSources. They put you in front of thousands of manufacturers. With access to so many competitors, you can ensure quality, price, and even order quantities for your product. Overseas products and global arbitrage are the key to your own Amazon success story. *Author’s note: While AdMagic operates independent of Alibaba, there’s a lot of printers and board game companies on Alibaba that I’ve used myself. The one thing that really sticks out with Cards Against Humanity is its simple design. Max and his friends weren’t graphic designers by any means. But they wanted to make sure it looked professional. They kept it simple. Black cards with white text and white cards with black text, all in helvetica font. Ditto the box. And the box stands out, doesn’t it? If you walk by it in a store where all the other games come in brightly colored boxes, there sits Cards Against Humanity in its simple (albeit heavy) black box. The same works for any Amazon product you’re designing. Remember, Amazon is just a stark white background meant to make its products stand out. When you design your product and its package, consider this. Once the manufacturer started working on Max and friends’ horrible party game, things slowed down a little. Back then, Kickstarter was still pretty new and didn’t have as much trust as it does not. Therefore, it was imperative that Max keep the backers in the loop. He sent regular email updates and eventually a video of he and his friends waiting on the game. Producing things overseas can take a while. The average product sourced on Alibaba has a 3-4 week lead time with another 2-3 weeks of travel. If you use the Kickstarter strategy like CAH did, then you’ll want to keep your fans in the loop. Even later, when your product hits Amazon, it’s important to communicate as much as you can. You can offer contact methods on the product’s packaging or instructions insider. Plus, you can use the automated email service Jump Send to check in on your customers. This can especially help you combat any potential issues before they come up in product reviews or seller feedback. Cards Against Humanity is an Amazon Success Story… and then some. Once the cards arrived in America and they fulfilled (by hand!) all the Kickstarter backer’s rewards, Max and his team needed a way to sell the excess copies. So, they turned to a new program Amazon had just launched called fulfilled-by-Amazon. The extra copies of Cards Against Humanity arrived at Amazon on June 15th, 2011. Only six days later they were #1 bestselling product in the subcategory games. By leveraging the backers and overall excitement of the game, Cards Against Humanity got off to a great start. So great, in fact, Amazon thought that the game might not even be real. Cards Against Humanity would go on to sell exclusively on Amazon for many years. 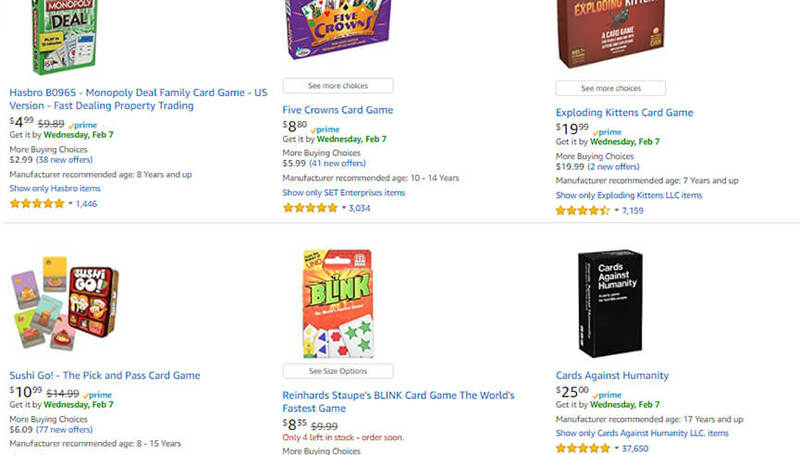 To this day, Cards Against Humanity is not only the top selling game on Amazon, but is frequently the top selling product in the entire Toys & Games category. Cards Against Humanity’s current ranking, plus a peek at its sales. Pulling it up with Accusales and the Jungle Scout Chrome Extension, you can see that it’s selling a whopping 50,552 copies per month on Amazon alone. This doesn’t count all the brick and mortar stores all over the world its in, nor does it count the expansions. All it took was an email list of a few hundred names, some great word-of-mouth, and the willingness to create a truly original product. The tools are there. All that’s missing is you! What awesome product idea do you have? And what’s keeping you back from making it a reality? Just look back at what Max and his buddies did. They probably had similar challenges. If they can do it–and create a multi-million dollar card game empire–then you can, too! The Genius Series – A free learning course that will teach you how to research, source, import, and market your own private label products. 5 Ways to Market Outside of Amazon – If you’re interested in learning some more techniques for marketing and pre-marketing a product, check out this blog post. 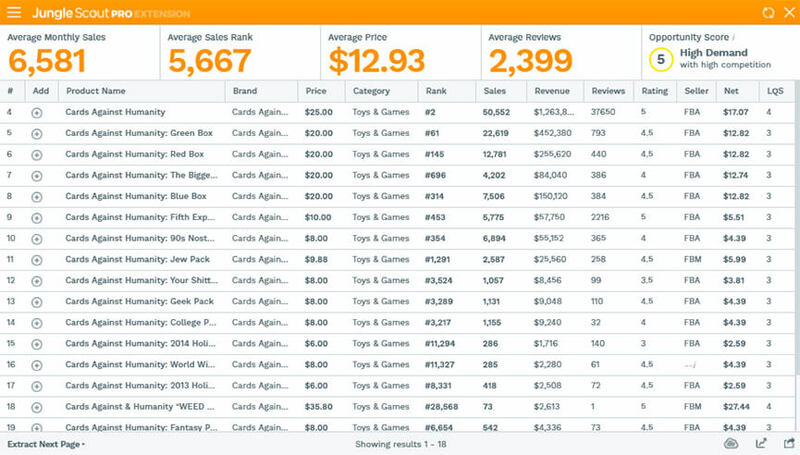 Jungle Scout Chrome Extension – To predict future Amazon sales, one of the best tools you can use is the Jungle Scout Chrome Extension which uses our proprietary Accusales technology. And of course, feel free to leave any comments and questions below. Congrats on getting started with Amazon FBA! It’s a ton of fun. Our support team definitely helps out with folks, and as long as you can use the internet with reasonable ease, you should be able use most of the stuff. Plus, we offer plenty of educational resources for the actual process. And of course, you’re free to ask as many questions as you like in the comments. I try to get to the comments nearly every day, at least Monday through Friday. Have you already gotten signed up for the Genius Series? That’s a great place to start as it’s relatively up to date and can help you learn the basics of Amazon selling.